This book compares primary education in urban and rural China and India. It focuses on how the sociocultural context including educational policy, educators and parents’ beliefs, and the conditions under which teaching and learning occur shape classroom pedagogy and determine children’s attainment. This in-depth, authentic, comparative analysis of the two largest educational systems in the world is a must-read for scholars interested in the teaching and learning in these two rapidly developing Asian cultures. A common set of questions has been addressed in diverse contexts. 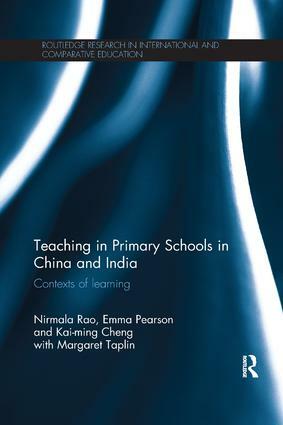 The empirical work on which this book is based is most impressive – videotaping of mathematics and language lessons, interviews with parents and educators questionnaires with parents, teachers and children and tests of children’s mathematics attainment – and this done in 3 locations in China, 3 in India and 12 schools in total.